A matt finish wedding band. This finish is also often referred to as a “satin finish” brush finish” or “brushed finish”. It can be applied to any ring, new or old. The ring pictured measures 6mm wide and was made in 18ct white gold. It has a flat top appearance but the inside of the wedding ring has been filed to a “comfort fit”. A comfort fit is where the inside of a wedding band is curved no matter what shape the top of the ring that is seen is. 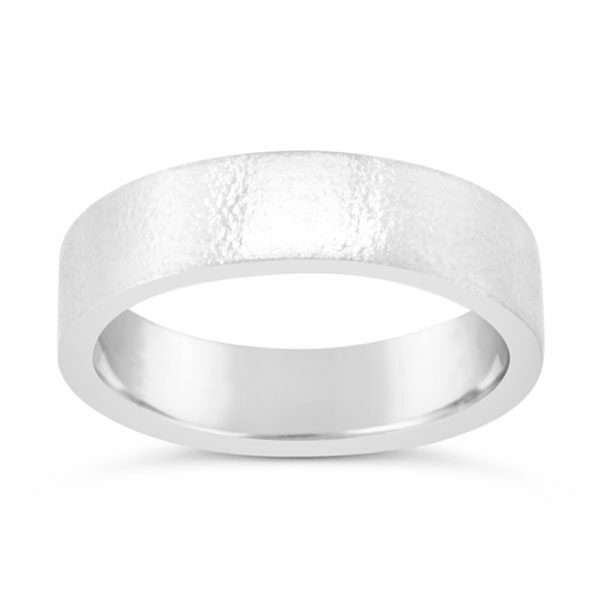 This matt finish wedding band is available in white, rose or yellow gold, 9ct or 18ct, palladium and platinum. Widths start at 1.5mm and go up to 12mm or more. Delivery time is 1-2 weeks, just email us your ring size, metal and width requirement. The ring pictured measures 6mm wide and was made in 18ct white gold.